Congratulations on being named a 2014 ENERGY STAR® Partner of the Year by the U.S. Environmental Protection Agency. Why was this award received? We became an ENERGY STAR® Partner, in 2006, and began using the “ENERGY STAR Guidelines for Energy Management” roadmap. We began the process of adopting the 23 attributes of an energy management program defined by the ENERGY STAR Facility Energy Management Assessment Matrix. We’ve been working, over these years, to check off these program attribute boxes. This guidelines document and the assessment matrix provided an excellent road map for us since day one. ENERGY STAR official Jean Lupinacci, center, presents the Partner of the Year award to Corning representatives on hand for ceremonies in Washington D.C. on April 29. With her are, (standing from left) David Kubissa, Mike Donnelly, Patrick Jackson, and Scott Ryan; seated are Steve Gattine and Beth Costello. Fantastic. Before we go further, what kinds of products does Corning manufacture and where? Corning Incorporated is the world leader in specialty glass and ceramics. Drawing on more than 160 years of materials science and process engineering knowledge, Corning creates and makes keystone components that enable high-technology systems for consumer electronics, mobile emissions control, telecommunications and life sciences. Our products include glass substrates for LCD televisions, computer monitors and laptops; ceramic substrates and filters for mobile emission control systems; optical fiber, cable, hardware & equipment for telecommunications networks; optical biosensors for drug discovery; and other advanced optics and specialty glass solutions for a number of industries including semiconductor, aerospace, defense, astronomy, and metrology. What role does communications play in an energy management program? Communications play a vital role. We have a great relationship with our corporate communications group. Communications is tasked with sharing our success stories. Our task is to take processes being learned by employees in one facility and share them with employees in other facilities. This kind of communication allows us to learn from one another. It’s an organic process and we’ve built it into the structure of the corporation. One thing ENERGY STAR® saw is how we’ve woven energy management into the culture of our company. It’s not just a program off to the side. We have a communications objective where every one of our facilities has a goal to provide two unique stories each year on how they are managing energy. The goal is to share these success stories so other plants can learn from them. We write stories describing the process in layman’s terms and publish them on our internal web site. Also, we send newsletters, and have an intranet site dedicated to the global energy management program. We encourage employees responsible for implementing energy measure to hold training sessions. We also have the Blue Line Internal Social Media platform being used as well. It’s all about using all communication tools to share knowledge and promote awareness and action. How is the Global Energy Management program structured at Corning? It all starts with the buy-in of the senior leadership at Corning. We have corporate champions and sponsors of the Global Energy Management (GEM) program. When we started the program, two champions were two of the top six officers in our whole organization. They were there to nourish and recruit new sponsors for various roles. They brought in five sponsors representing engineering, procurement, government affairs, the business service division, and operations/manufacturing. Nine years after launching the program, energy management continues to receive support from the highest levels. Business services is the division where the program resides today. I am the director of Corning’s Global Energy Management. We have an operational manager who is the conduit between me and the businesses. Each business has a divisional energy manager. Within a business, we have site energy managers responsible for an energy team (a team is more than five people). Energy team members have other jobs and include this responsibility into their roles. Some site energy managers have other full-time positions. What advice would you offer to Energy Managers starting a program? I would say realize you can’t do it all every day, you need to be systematic, and set some realistic goals for years one and two. Earn initial internal credibility by tackling easily-quantified, low-risk, energy-saving projects like lighting. Build the program in a progressive manner. Getting senior sponsorship is also critical. This ensures the energy management program is doing things that corporate leaders want and in this way they can open doors for the program. We’ve gotten a lot of support from corporate leadership and our management committee. We believe ENERGY STAR® is the best resource out there to learn how to start an energy management program. We are an excellent example of a company starting from scratch and using ENERGY STAR® to guide us. Betsy Dutrow, director of Energy Star Industrial Partnerships, provided us with the program model and resources. Also, by becoming an Energy Star Partner, one can network and learn from other Energy Managers. When I got into this, I was the business manager for Corning’s Business Services Division. I reached out to Betsy and rest is history. How did you get involved with the energy management program? As mentioned before, I was the business manager for the business services division, and my third biggest spending area was energy. The top two expenses were salaries and buildings/depreciation/taxes. We thought we could reduce energy spending and created a program just for office buildings. Managing costs is a critical performance metric for strong financial results in any corporation. Any initiative involving methods to strip-out wasted effort, wasted cost, and wasted resources will receive attention from senior management. When we decided to move forward, we used Six Sigma to develop our process. We did a lot of upfront planning and process management. This was critical in that we didn’t want this to just be a series of projects. What metrics are used to measure results? At the corporate level, we measure energy usage per dollar of revenue generated. This is what’s called an energy intensity measure. We look at electricity and natural gas separately. In each division we use a similar fraction. The businesses track energy use and energy cost, and both become a numerator. We then divide the numerator by the units of products produced or the revenues produced by that business. This creates apples to apples comparisons for us to look at. Creating metrics is an ongoing discussion and we continue to refine them and make them better and more useful. We’ve had situations where folks have asked us to use different metrics. We evaluate these on a case-by-case basis. We are proud of the cumulative efforts Corning team members have made. A key metric is the one mentioned before – since its launch, the GEM program has saved Corning more than $328 million in cumulative energy costs. What specific energy efficiency projects do you focus on? We’ve done so many energy efficiency projects including, but not limited to, compressed air, motors, demand management, metering, and lighting. We believed we should go step-by-step, starting with specific facility projects like lighting. Then, after gaining credibility, we began to tackle process improvements. Our future steps include going to research & development and examining how to innovate while using less energy. We are also looking at how to take energy out of the value chain by involving our supplier and our customers. How can we share waste-heat with our clients? Can waste-heat in our factory be used to heat an office building in our community? That’s the end state. How important is compressed air as an energy source? Compressed air is very important to our manufacturing processes. It’s critical we manage it well both in terms of ensuring its reliability as an energy source and from an energy-cost perspective. We know a lot of energy goes into air compressors and we also know that compressed air has a direct impact on our manufacturing processes. We focus on areas such as air compressor management. We’ve also worked hard “to maintain the gain” after compressed air system assessments are executed successfully. The different businesses realize compressed air systems require an on-going program to keep the systems at peak reliability and efficiency. We’ve worked with some of the fitting companies to put the right fittings on the process machines. Some companies offer assistance to review fittings designed to reduce compressed air losses located on pneumatic circuits within the process machinery. 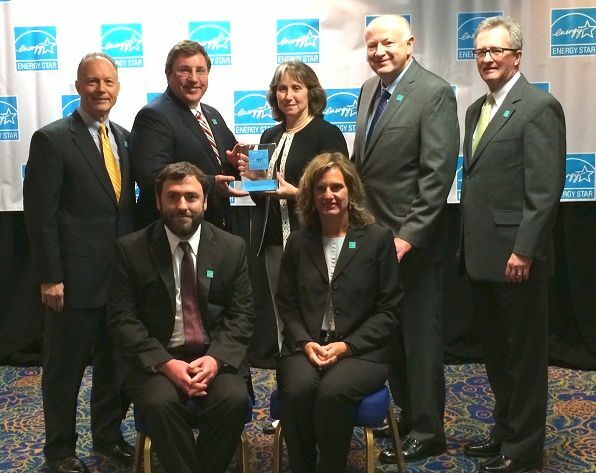 Thank you for your insights and congratulations for Corning being named a 2014 ENERGY STAR® Partner of the Year.